I'm going through my collection of unofficial Tull shows and adding them to my list. I'm thoroughly confused concerning the Seattle shows from the 1973 tour. * In doubt. Two Seattle concerts within a week might seem improbable anyway, but especially if they weren't consecutive nights. ** Though another source claims Tull were in Vancouver on 24/7 and Seattle on 26/7, Trower and an audience member confirm this concert. 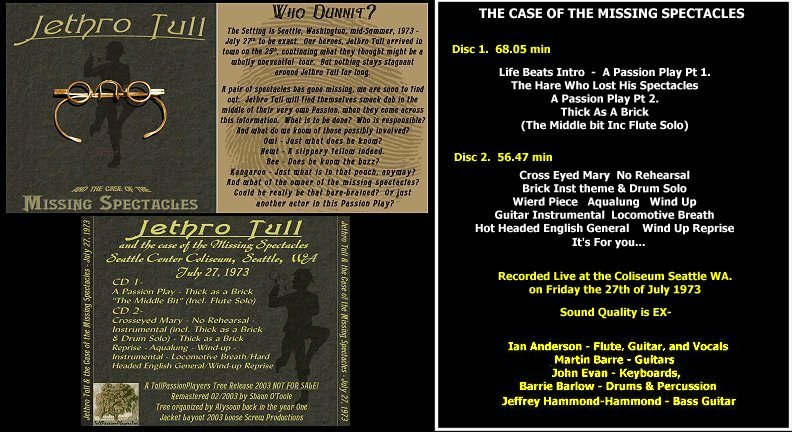 *** Recordings of this show and, allegedly, 26/7 are in circulation, but careful comparison shows they are really from the same concert and it seems the 26/7 date is erroneous, as Tull & Trower were apparently in Vancouver. So using the data from "Ministry Of Information" it's easy to assume that the only performance in Seattle for the 1973 Tour was on July 27. This ticket stub (if real) looks to support that Tull was in Vancouver on 07/26. So what is the correct date(s) for Seattle in 1973? I'll admit the above is something I've puzzled over for some time. I'd stick my neck out and say that your assumption is quite possibly correct about the Vancouver concert being 07/26. The same thing applies to the Japan concerts in '72. Some bootlegs get around this by just claiming to be the "Japan Tour 1972" and some actually date the concerts but comparisons sometime can't confirm the actual date or concert. Though I cannot help exactly, I can advise you to throw out logic when it comes to that era Tull . They were ambitious to the point of illogical bookings. They added nighst very frequently, when gigs sold out fast, and sometimes it was not possible to keep the concerts consecutive...Playing in Seattle, dashing up to nearby Vancouver for a night ( albeit with border crossing complications) and coming back for an added night fits the pattern of those days. In 1975, when they added 3 nights in LA to the original 3 nights planned and promptly sold out, they used the 48 hours in between the LA shows to play single nights in Tucson and El Paso. Ian was a madman and did not hold with nights off if he was paying crew and truckers etc. I attended the Seattle Passion Play concert, opened by Robin Trower, and I'm quite certain of two things - first, it was July 27, 1973 and second, they only played one night in Seattle. I remember buying the tickets, and believe me, as a rabid fan, had there been tickets for more than one night I would have known about it and attended both shows. I saw the band in that same venue (Seattle Center Coliseum) in '71,'72, 73, 75, 76, 77 and '79. Did I mention, these were the best concerts I ever attended? particularly TAAB in 1972. In later years, the band began playing smaller venues as their popularity waned, but I was sill there. Sounds definitive to me...How could one of us not remember if we saw APP once or twice...or if Tull played once or twice in any particular venue on that tour? Thank You for this info! This board is my new home ... it's been a VERY big help in keeping me and my collection "up to date". Some years ago I read on a now defunct site on the web that they actually played 3 concerts in Seattle in July '73 but in hindsight this info was from bootleg sleeve notes so I've always presumed it was always the same concert and with the bootlegger mixed up the dates etc. Thanks to jethrotull for clearing this up. This is one bootleg sleeve which is clearly wrong date wise. and a correctly dated one.